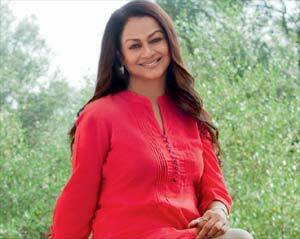 Born into a Muslim family in Visakhapatnam, Zarina Wahab was the one, among her three sisters and a brother, who always aimed high. While still in her teens, she left her home to chase her dreams. 'I was still in school when I saw an ad about an acting course that was to start at the Film and Television Institute of India in Pune. I immediately applied and moved to the city, and two years later, came to Mumbai looking for a break in Hindi films.' She switches easily between Hindi and English and is completely down-to-earth. At that time, Dev Anand was looking for a fresh face to play the role of Zeenat Aman's sister in Ishq Ishq Ishq. Zarina went for a screen test to Mehboob Studios, where she met Dev Sahab for the first time. 'I was smitten by his good looks! The screen test went well and I got my first break,' she says. That was in 1974. Two years later she got a call from Rajshri Productions which was to change her life. They were looking for a heroine for their new film Chitchor opposite Amol Palekar. Zarina played a typical village girl who falls in love with a city boy in this romantic comedy of mistaken identities, which was directed by Basu Chatterjee. The film was not just a runaway hit but also received critical acclaim. 'God was very kind to me. I didn't have to struggle too much… and also in those days, competition was not as tough as it is today,' she says. Alongside, she acted in several south Indian films; she was fluent in Telugu, her mother tongue. Zarina's debut Malayalam film was Madanolsavam in which she was cast opposite Kamal Hassan - already a big hero down south.